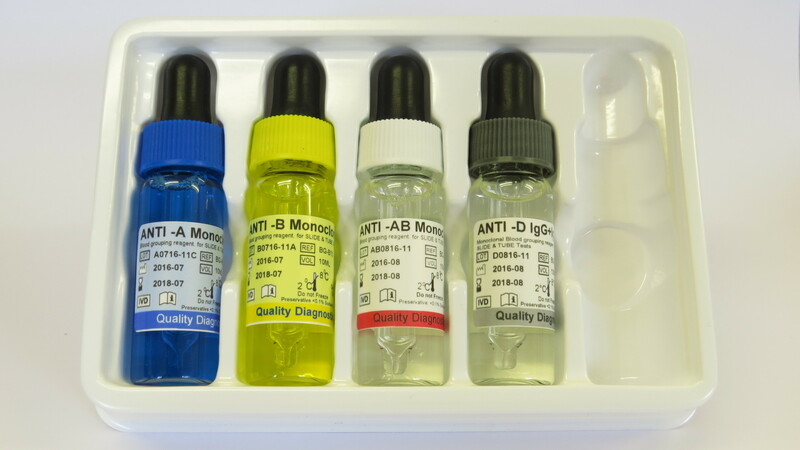 Anti A, B, AB, D (IgG & IgM) Monoclonal Blood Grouping Reagents Kit for the slide, tube and microplate techniques. These reagents are suitable for use by the slide, tube and microplate techniques and are designed for use by operators trained in serological techniques. Anti-A monoclonal murine IgM blood grouping reagent contains antibody from the cell line BIRMA-1, Anti-B monoclonal murine IgM blood grouping reagent contains antibody from LB-2 and Anti-A,B monoclonal murine IgM blood grouping reagent contains antibodies from cell lines ES-4/ES-15. When used by the recommended techniques these reagents will cause agglutination (clumping) of red cells carrying the specific antigen (positive test). Lack of agglutination of the red cells demonstrates the absence of the specific antigen (negative test). These reagents have been optimised for use by the recommended techniques without further dilution or additions. The presence of the D antigen is determined by testing the test blood cells against the antibody with known anti-D specificity. The reagent will cause direct agglutination of test red cells that carry the D antigen and indirect agglutination of test red cells that are Category DVI in the antiglobulin (AHG) phase of testing. The agglutination of the red blood cells being tested indicates the presence in them of the corresponding antigen. No agglutination generally indicates the absence of the D antigen. The D antigen is the most clinically significant non-ABO red blood cells antigen and has been implicated in causing Haemolytic Transfusional Reactions and Haemolytic Disease of the Newborn.